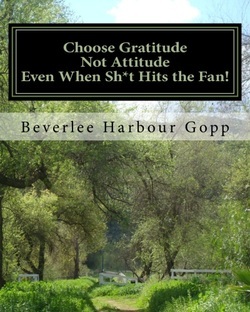 "Choose Gratitude Not Attitude Even When Sh*t Hits the Fan"
As the Author of Choose Gratitude Not Attitude Even When Sh*t Hits the Fan and Creator and Coach of Walking In the Now, Aunt Be knows the best way to live a healthy and full life is to stimulate our organs by eating healthy and exercising! Want a quick pick me up? Try this first thing in the morning or during an afternoon slump ` this is a GREEN DRINK that doesn't need a juicer or food processor. Use a blender for this easy recipe: Handful of Spinach, Half Handful of Salad Spring Mix, 1/4 Cucumber with peel - cut up, 1/2 lemon - squeezed. Add everything to the blender. Pour in water until about 2 inches from the top of the blender. Add 5-6 ice cubes, cover and blend at top speed for about 2 minutes.